SKI IN/SKI OUT--Two blocks from the town center. Great slopeside views! Newly redecorated with views overlooking Four O' Clock Run. This unit is roomy with 1800 square feet with 3 bedrooms plus a loft. Sleeping accommodations include 2 kings, 1 queen, and 4 twins (not bunks). Ski-in on Four O'clock Run right to the condo. Ski-out from the Snowflake lift in front of the condo about 1/2 block (100 footsteps) to lift. No lift lines-the lift services only our neighborhood. Great views of mountain and ski slope from all rooms. Nice open floor plan with a gas fireplace in the living area . Great for warming up after skiing. Access to the upper village hot tubs and indoor/outdoor pool with changing rooms, about a 5 minute walk through Primrose path in the neighborhood. Sledding on four O'Clock Run provides great fun for the kids after the slopes close in the afternoon. Located next to the lift provides easy access for skiing and just two blocks from Main Street shops and restaurants this a perfect location for enjoying Breckenridge without getting in the car. In addition to skiing other winter activities include sleigh rides, snowmobiling, ice skating and tubing. Summer also offers beautiful weather with many activities. Enjoy the mountain views while mountain biking, hiking, golfing whitewater rafting, or trout fishing. We joined VRBO in 2003. Grew up skiing in the Colorado Mountains. Don't have time to live in Breckenridge so we share it with you! Hope you love it as much as we do! Breckenridge is our favorite mountain. Ski-in/ out. Fabulous slope side views. And two blocks from town. 2.5. Half bath is large enough to keep a duffle in with clothing for changes and grooming. Amazing downtown, just two blocks to the center. No need to get in the car. Condo sits right on the slope. Beautiful view of the ski slope and mountain. Fun for sledding right outside the door after the slope closes. Ski directly to the condo on Four O' Clock Run. Ski out from the front of the condo using Snowflake lift. Snowflake lift is private- available to our neighborhood only. It is approximately 100 yards to the lift. Ski right to the condo via Four O' Clock run. Ski out from Snowflake lift, about 100 steps from the front of the condo. Gas fireplace on main level. There is one designated parking space. Additional cars may be parked at the lot on airport road which has a shuttle service. *Everything is within walking distance. Just 2 blocks to town. Galley style kitchen open to living area. Table seating for 8. Bar seating for 3. One TV in living area and also downstairs bedroom. Swim in-out pool, a short walk from the condo, down primrose path. Changing rooms with showers. 2 large outdoor hot tubs, a short walk down Primrose Path. Changing rooms with showers. Had a great stay in this unit. It was really convenient to be so close, we could see the bottom of the Snowflake lift just a few short steps out our door. Really enjoyed ending each day with one last ride down 4 O'clock Run, right up to the back of our unit. With just a 10 minute walk down to Main Street, it was easy to meet up with friends for dinner or drinks after a long day of skiing. It was a chilly walk over to the pool area, but when we got there, we had no trouble accommodating our group of 6 in one of the three hot tubs. 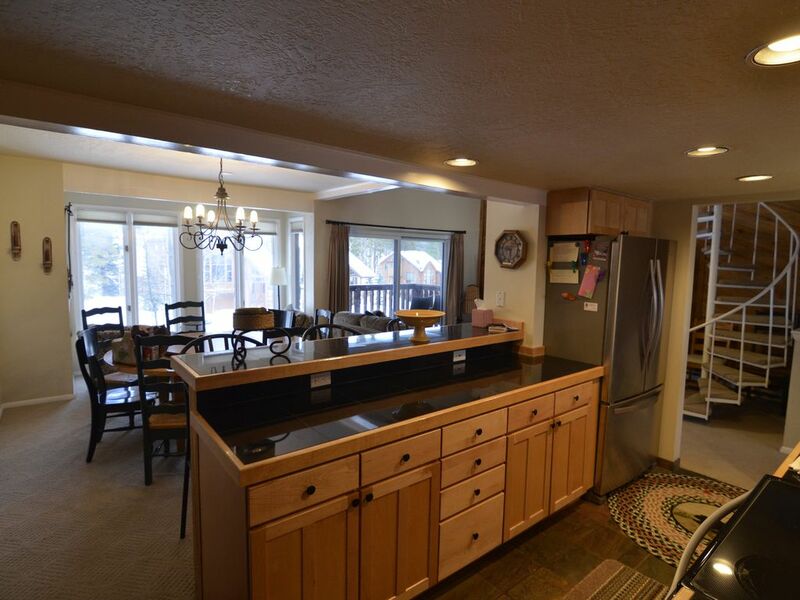 I highly recommend this unit for those looking to enjoy Breckenridge's great skiing or exploring the town. Been coming to Breckenridge for many years and have stayed in many locations all over town and this is probably my favorite. No matter your interest, everything is close by. Short walk to town regardless of weather. Multiple bus stops close by for the Free Ride bus system. Snowflake Ski lift is about 100 yards away, take you to peak 8. Four c'clock run is your backyard. You can ski out down the run which will leave you on the main road. Grab the bus there for a 2 minute ride to the gondola station. Ski back home on the 4 o'clock run, which is a beginner run. The owner Jill was very responsive. We were a large group of 7 and needed an extra humidifier. Within minutes of request, humidifier was at our door. We also requested a late check out which was happily granted. The place was spacious and never felt crowded with 7-8 guests roaming around. Beds were comfortable. Great view of the slope from all rooms. Great management and great owner, in a prime location. Would definitely recommend this property to anyone. Nice place to stay, location is good. We stayed here for a couples weekend get away to ski and celebrate a birthday. Its really set up for two families but we found it was very nice for two couples because it was so private. With a king upstairs with extra bedroom and bathroom, then a king downstairs with an extra bedroom and bathroom and then the living on the mid level it provided great privacy for two couples to live without bumping into each other. It was very clean and the heat worked well when it dipped down in the teens. Its a bit dated but for the price it was fine. Parking was a bit limited and the walk up the hill then up to the second floor in full ski gear was challenging in the altitude we were not accustom to. You take a short walk up a hill to get to the "snowflake" chair lift from there you can go over to peak 8 and 9. You just take the 4 o'clock run home and ski right to the condo. Very nice feature. 4 o'clock run is a nice easy run to take home. I would recommend the owner leave instructions on how to turn on the downstairs shower. We figured it out but from the looks of the faucet people had a hard time figuring out how to start the shower. Tip, pull down on the round metal gadget on the tub faucet to turn the shower on. Watch out, the water gets very hot but welcoming after a long day of skiing. Its and easy 10min walk to Main Street, we only used our car once to get into town and then back to Denver. Condo is well stocked with bath linens, comfortable bedding, and everything needed to make a full course meal. Proximity to town and Snowflake lift is perfect! Nice location and good facilities. The distance from the room to the pool and hot tub is too far to be useful. Rental terms will be sent via email when reservation is made Please pay by e-check rather than credit card.